I am a glass half full girl (most of the time). I try to adhere to that perspective when I can, but I admit I’m not always successful when one of my kids is suffering. This summer we had a dual whammy of a disheartening diagnosis for my son’s movement disorder, coupled with the knowledge that his affliction was from a medication we put him on years ago. For two months I was just not my usual optimistic self. Along with this movement disorder came regression in several areas of his life, making him very difficult to deal with, plus a lack of appetite that made him drop twenty pounds over the course of the season, this from a kid who always wanted to eat. Most disturbing to me however was a notable absence of joy, limited laughs and smiles from a kid who worked so hard all these years to break through to his core, his generally happy self. I mourned that former self. And the guilt of thinking his father and I “did” this to him from a medication he’d taken was devastating. 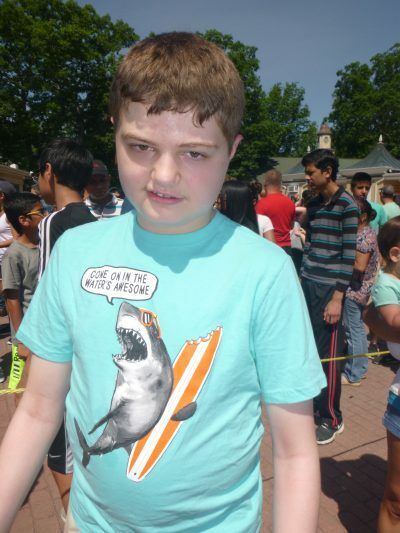 Of course, if you read last week’s blog, we took him to an expert at UPenn in what he supposedly had, and he has tics/stereotopy instead, not from medication, possibly from puberty. And possibly just because he’s severely autistic. I’m still distraught that he has yet one more challenge to live with in his life. I thought severe autism and OCD were enough (apparently not! ), but we have a course of treatment for him and have seen some improvement, so his father and I are guardedly optimistic. I am relieved this isn’t from a medication, and hopeful that although we won’t be able to eradicate the tics we can hopefully ameliorate their significance in his life. We’ve already seen a few smiles break through in the last few weeks. They are glorious to behold. I beat myself up throughout the entire summer, even though the medication we put him on years ago was absolutely necessary at the time. It helped him stay in his private school. It maintained peace and a healthy household. It made him less irritable, more able to contain his frustrations with life and not take them out on his family or teachers. I know we made the right decision all those years ago. And yet, my brain kept saying to me we should have made a different choice, despite every family member, personnel from his school, and BCBA we’ve known since he was a toddler telling us differently. Years ago I made a promise to myself that if we made a decision that ended up being a mistake, I wouldn’t beat myself up over it. Autism doesn’t come with a handbook; sometimes the options surrounding an issue are just different shades of terrible. Couple that with knowing we’re making all his choices for him for fifty years, and everyone is bound to make some mistakes. And it is absolutely critical to your mental health, the welfare of your autistic child, and your other children that if you make the wrong choice, you forgive yourself. I didn’t hold to my promise, the promise I’d remained faithful to for years. I’m back to it now, am able to think more clearly and focus on helping my boy, not on how I thought we’d inadvertently hurt him. So many of us who dwell in the world of severe disability are so hard on ourselves, second guessing every decision, regretting every wrong turn made. And I’m telling you this as a fifteen year veteran of the “autism” life- you simply must stop. Be kind to yourself. You can only do the best you can at the time in every situation you encounter. Remember that. Learn from your mistakes. Know that this life is sometimes impossible, and all you can do is try to give your child, and your family, the best life possible. The most important thing is you have to be whole and healthy for your child. And you can only do that if you’re gentle with yourself.